Med Health Services (“MHS”) provides a complete menu of outpatient lab and imaging testing that empowers doctors and patients alike to take a more preventative approach to their health. Our testing saves patients’ time and allows their doctor to evaluate them in an efficient and hands-on fashion. This is the way of the future in medicine. Founded in 1993, MHS delivers modern-day, patient-centered outpatient medical care in its truest form—by providing the General Practitioner, Internist and Family Medicine doctors’ office with high technology diagnostic testing services that allow attending physicians to have greater control of care over their patients’ health and diagnose in a timelier fashion. Today’s health care model is one in which diagnosis often takes place symptoms are already present, and diseases have begun to manifest. We are committed to changing that by offering expeditious, same-day testing in order to diagnose without delay and detect diseases before they happen. We provide physicians access to the latest modern technology, allowing them to provide testing services in a timely and cost-effective manner. 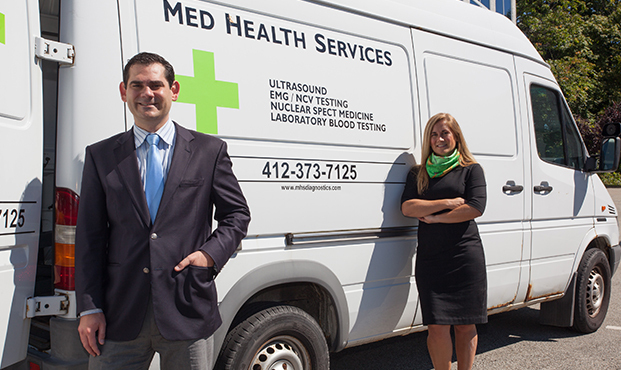 These testing services were formerly only provided in the hospital setting. Our model is highly beneficial for physicians and their patients as it simplifies diagnostic medical testing, offers the most competitive pricing, and alleviates the complexities, time delays and bureaucracy found in the large medical institutions. One case in point is the “silent killers”—stroke, coronary artery disease, cancer of the rupture of an abdominal aortic aneurysm, to name a few—that show no signs of early symptoms unless they are detected in advance. Early detection almost always happens in the outpatient environment, while the terminal stage is often detected in the hospital emergency room once a patient has already suffered a heart attack, cardiac arrest, stroke, etc. These “silent killers” are the leading cause of death today and must be prevented through pre-screening testing that is ideally performed in the outpatient environment, allowing physicians to equip themselves with the resources necessary to diagnose in a timely fashion. MHS delivers patient-centered testing solutions that are affordable to everyone and enhance the patient’s personal experience and continuation of care. Our upfront and transparent pricing is always available and is a fraction of other outpatient testing centers. Our philosophy of early detection is one where you no longer have to be symptomatic in order to get a test, and cost is no longer a barrier to compliance. The result? A drastic reduction in unnecessary consultations to specialists, hospital and ER visits. Patients can get the tests they need while their attending physician gets the reports needed—earlier and in time for treatment to be effective.